Function: The king pin serves as the pivot point which attaches the wheel spindle to the axle beam and is considered to be the most critical component of the axle assembly. It provides the means for the drag link, in connection with the steering arm, to change the lateral movement into turning motion. Features and Benefits: Since the king pin is the very heart of the axle assembly, it is mandatory for a replacement part of this nature to be of the highest quality. All Dayton Parts pins utilize high quality steel and are heat treated for superior strength and long service life. A satin smooth micro-finish insures minimum steering effort yet retains the ability to hold grease for proper lubrication. 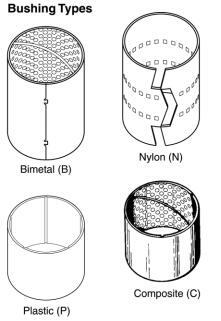 Bushing Types: Dayton Parts offers the installer three distinct types of bushing materials. Each has its own unique benefits. Nylon (Delrin) bushings provide reduced steering effort and are fast to install since they do not have to be fitted. They are generally only recommended for vehicles which spend most of their time on-highway. They tend to wear out faster than bronze bushings in severe service applications. Steel backed bronze (bimetal) has traditionally been the bushing material of choice of many mechanics. Very close bushing to pin clearance can be obtained either by honing or reaming. They are more tolerant of contaminants than nylon and provide considerably longer milage in severe service applications such as refuse and dump vehicles, etc. Composite bushings are now being utilized in new axle production by most North American axle manufacturers. These incorporate a steel backing as with the bronze bushings. However, the inside diameter features a low friction acetyl resin polymer surface which is dimpled and grease grooved for better grease distribution than the older nylon designs. The bushing is usually shorter than its bronze counterpart. They may or may not require fitting depending on the axle manufacturer’s design. However, only reamers can be used if required. In general, more care must be taken when installing to prevent damage to the bushing. Routine: Install a dial indicator so that the base is on the I-beam and the tip is against the side of the top of the knuckle. Set the dial indicator to “zero” and move the top of the tire side-to-side after raising vehicle and installing jack stand. Repeat for lower bushing. If dial indicator moves a total of 0.010” for either, replace with a new king pin set. Safety Inspection: Apply service brake to eliminate wheel bearing movement. With front end lifted and jacks installed, grasp tire at top and bottom and attempt to move in and out. Reject the vehicle if measurements at the top or bottom of the tire at the outer circumference is greater than shown. Note: Inspection methods listed here are highly abbreviated. Always refer to vehicle or axle manufacturer’s service manual for correct step-by-step procedures.